Mechanical Doping A new year, a new cycling scandal. The never-ending dance with drama continues in the cycling world. Still wounded from a plagued history of cheating, the presence of mechanical doping at top level cycling disciplines has caused even more investigations to take place. You may be unfamiliar with the word ‘Mechanical Doping’, so what exactly is it? 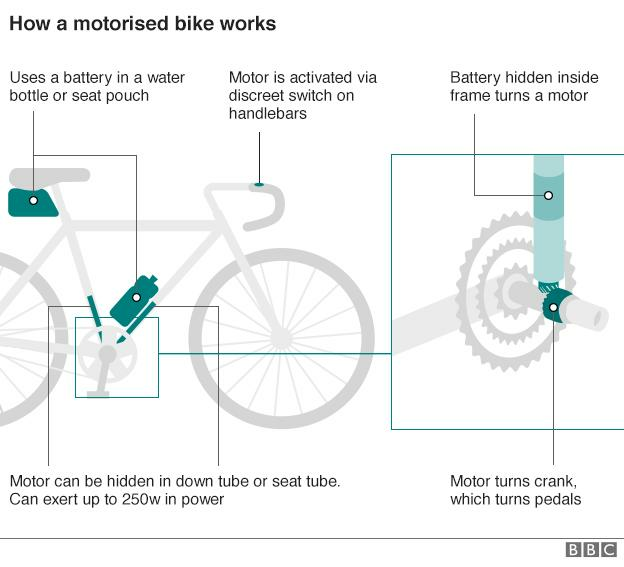 In essence, it is using devices such as miniature motors inside the bike frame to gain even more power. Rob Hayles, the former Olympic cyclist, has explains it like this; “If you are averaging say 350 watts for a 200km race and if you can generate an extra 50 watts, then that is a big percentage… it would be the equivalent of attacking off the front and going solo but feeling like you are on the wheel, slip-streaming”. According to Bradley Wiggins, who was interviewed recently in Dubai, test for mechanical doping have been going on for almost 5 years now, with this being one of the first instances in which they have actually found evidence of foul play. After his Hour record attempt he says his bike was taken away and completely stripped down by the International Cycling Union (UCI). This prior mentioned case was a 19 year old Femke Van den Driessche, a Belgian Cyclo-cross World Championship rider. Since this scandal broke, she has released a press conference stating that she knew nothing about the device and that the bike wasn’t even hers. The bike belonged to someone else, a training partner of hers, and that she was not intending on using the bike to race with. Like the rest of us I’m sure you’re also sceptical about these comments.